Happy Monday of Independence week! I can't freaking believe it is the last day of June. How did this happen? I LOVE summer and unfortunately it is just flying by way too quickly. The good thing is that I have been getting a lot of time at my uncle's pool (every weekend in June! ), I have been flying through novels (reviews to come!) and I have had lots of time for baking (my waistband has been a little tight lately). Summer, I love you. In non-summer news, I took these pictures with my tripod. I know lots of people do it and it's soooo not a big deal, but this was my first time. I am actually impressed with how the pictures came out for my first shot, but it was so awkward. I am convinced my neighbors were laughing at me from their windows and I just felt so outrageous running back and forth to check the focus and lighting. The things I do for this silly blog. This outfit is adorable. ! agree about summer going too fast. It feels like it's almost over already! But I know the hottest days are yet to come in August! And yeah, tripod pictures are so awkward. I don't even want to know what my neighbors think of me. You did a fantastic job with your tripod pictures! The pattern on the skirt looks so neat with the mint sweater. I love it! Also, jealous of your calm summer. Mine has been the exact opposite of that. I really love your outfit! The mint and blue go very well together! I've only tried doing tripod pictures once, and I couldn't figure it out at all! I even asked hubby about doing that (it's his camera I use) and he doesn't even know how to set the timer on his camera. There's a lot I need to learn about photography apparently. Your pictures turned out really well! So cute! Love that color combo! And sometimes I use a tripod... it has been really hard for me to adjust to it. It is so much harder!! These look great! I'm measuring my summer in weekends now - they fill up so quickly, but there are so many things I have planned and am looking forward to so much that just aren't coming fast enough! And yet, I will be sad when summer is over and it will feel like it went by too fast. I love the skirt/shirt combo. I have a weird question - what are you doing when you are layering/tucking in. I try to tuck shirts into various bottoms, but I feel like a lot of the time it makes my body shape look weird. I'm sure this is just a thing in my head that I have to get over, but every time you do it you don't look bulky! Are you not actually tucking? Are you buying materials that are just the right thickness? Are you a magician? Maybe my waist is just weirdly big for my frame (I'm small). Fashion is confusing. Haha, I love your question. The truth is that I AM a magician, so sorry - can't help :) Actually, I have had others ask me the same thing! Maybe I'll do a whole post about it? Short answer: I think a lot of it is a body image thing - you just have to get used to the way it looks. Also, the weight of the shirt comes into play. I think bulkier fabrics tend to look better with the half-tuck so that you can see your waistband a little bit. Lighter weight shirts look good all the way tucked in. And length is a factor as well - it obviously needs to be long enough to tuck in, but it if it's too long it can end up looking bulky. Ah - I LOVE this one! Cute, cute! I do most all of my outfit pics with my iPhone sitting in a coffee cup on a window ledge. Talk about funny if someone walked by! Such a cute outfit! These came out great with the tripod! That's how I do mine too, but I'm on my back porch and my neighbors have only seen me a few times haha. I really like the mint and purple combination here, and your hair is too cute! I can't get enough of your short hair ! I know, I want summer to slow down a bit also since it is flying by! I really like this mint color on you! It is so flattering! I do NOT understand how July is tomorrow!!!!!! Isn't that insane? You look so cute! Fun skirt with the wedges. I love your hair curly. My husband usually takes my pictures, but I self-time some in our backward occasionally. I always sort of internally laugh...it really is a strange thing. I think your pictures are great! Great outfit!! Love your cute hair. 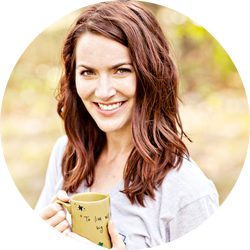 I got a tripod last year for Christmas and am embarrassed to say that I've never used it! I need to figure it out ASAP because it would be nice to have that option for photos. Yep, I'm convinced tripod photos are the most awkward thing ever. In other news, cute skirt! Sometimes my daughter or husband take my pictures and sometimes I use the tripod. I always feel funny and I have to take so many more with the tripod to get a good one. Your pictures turned out great! 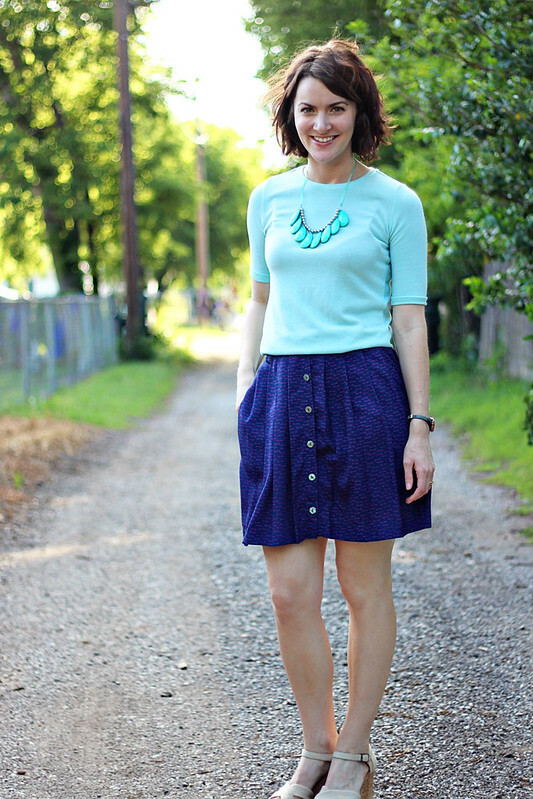 Love your skirt and your DIY necklace! Yeah taking your photos with a tripod does make you feel awkward and silly but you will get used to it. :-) Lucky you have been enjoying pool life. I need to do something before summer is over! I never would have guessed they were tripod pictures! They turned out really well! I did that once and they were not that great... haha. I think unless I bought a remote, I wouldn't bother with the tripod. I like the color combo of your outfit here! I especially love those wedges! I actually tried on a pair of Toms during the Nordstrom Women's Sale and they were much more comfortable than I would have thought. Are the wedges the same way? You are making me feel so good, Lauren! Yeah, since I have a remote it definitely helped. I don't think it would be worth it to keep running back and forth! Thanks for the wedge love - I found them on sale last fall and I really like them a lot! I have never owned a regular pair of toms but these are really comfortable. They are a little higher than I normally wear which can be strange at times, but in general they are really comfy and easy to walk in! You did a great job taking these pictures yourself! I have only taken my own pictures a few times and making sure everything is focused can be hard! Sounds like you are having a very enjoyable summer! The outfit is really cute but I am loving your hair. I know you cut it awhile ago but it is still so cute! Sounds like you are having a great summer, reading is the best part. Your hair is looking really good in these pictures. It has the perfect wave. Great job on the tri-pod pics. I never have much luck. And love that necklace! This color combo is so beautiful! haha i would have never known these were taken with a tripod, fabulous photos! i love this outfit, the skirt is so cute - can't wait for book reviews, and i feel you on the waistband tightening, oops! ps you make me want to cut my hair! so fetch. very nice...i like how you got that bokeh effect, too! Great job with the tripod! It's nice to have it as backup when a photographer is not available! Fun summer look, lady! 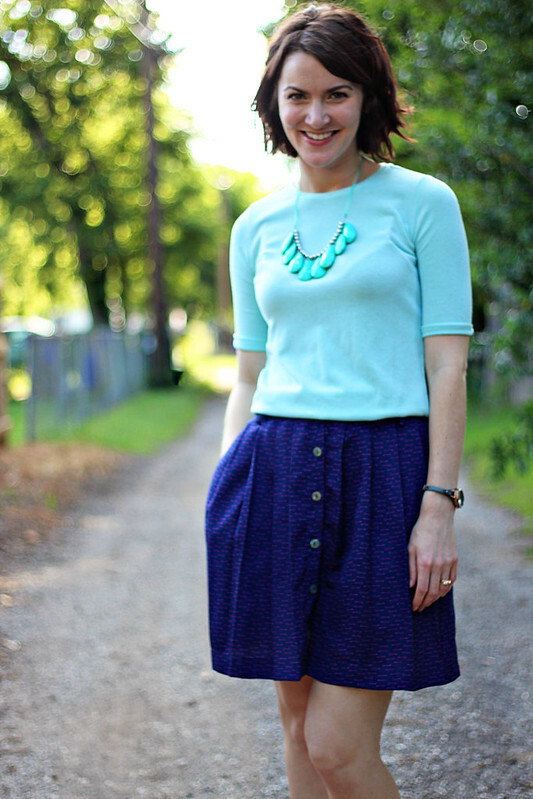 love these two shades of blue together, you look so chic ! I LOVEEEEE YOUR HAIR! And your outfit - but your hair is darling. I take tripod pictures too and I will agree that it can be super awkward - I've been doing it solo for months and I still have to wait for the ideal time of day to run outside with all of my stuff and hope that a car doesn't drive by. The photos have come out rather well, couldn't have guessed that they were taken on a tripod. 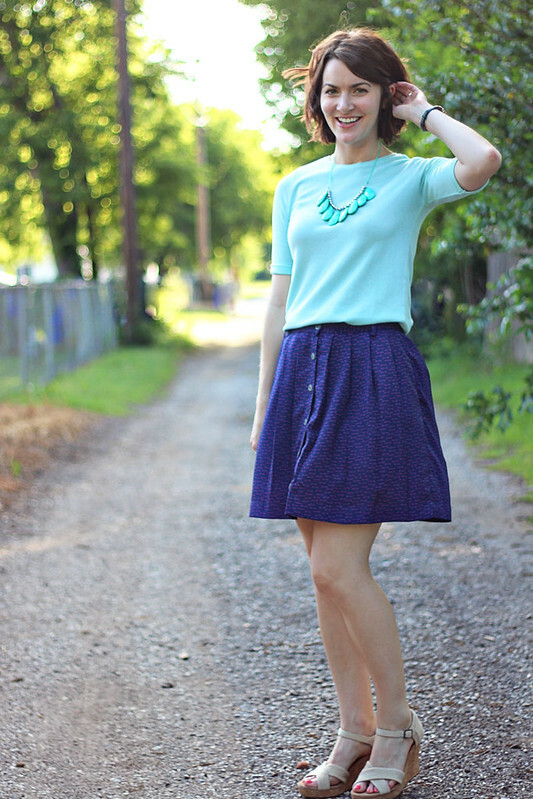 You look great, quite like the color combo and the statement necklace adds the right amount of interest to the outfit. Wish I could devote as much time to reading, just finished Inferno like a wk back (dragged through it cause it was sort of boring). Thinking of reading the Cuckoo's Calling!